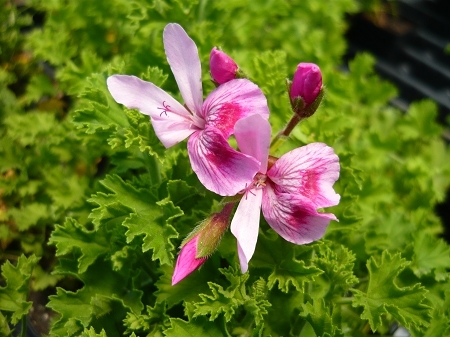 Strawberry Scented Geranium - Also known as "countess of Scarboro". Stiff green ruffled leaves have a delightful fruity scent. Dark pink flowers when in bloom. Upright, stiff growth habit. Nice container plant. Perennial zones 10-11+ Live starter plant in 3 inch container.